A Mānoa Valley Wahine Talks Story About Her Crazy, Wonderful, Life — no be sked da pidgin! I have loved horses all my life. My friend Kikue and I often quote the local song, “’round the Ko‘olau Hills we’d ride on horseback'”, wishing we’d known each other back then and could have ridden around Kane‘ohe together. My horse Kapi‘olani was my best friend growing up; into her ear I whispered all the secrets that I couldn’t tell anyone else. Nolemana and I have pastured horses here for almost as long as we’ve lived here. When my friends Linda and Pat moved from their farm, our friend Dewey brought his part Arab gelding Thunder here. Thunder lived here many years until he died very suddenly and tragically several years ago. 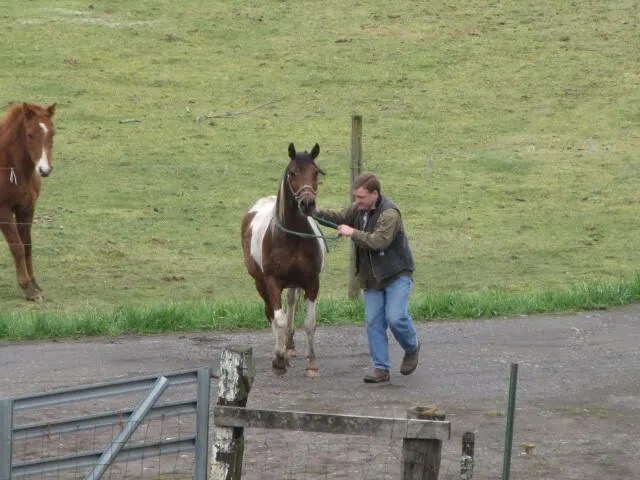 Dewey’s other horse Patty, now renamed Sierra, who’d lived here until last summer, was bought by our neighbors when the doctor told Dewey that at his age (mid 80’s) it was time to give up horseshoeing and bucking hay. We were anxious to get another horse in the pasture, not only to have one to keep down the summer grass, but also to keep our farm deferral. It was pretty lonely without a horse around, though Sierra and Sam were just across the gravel road. 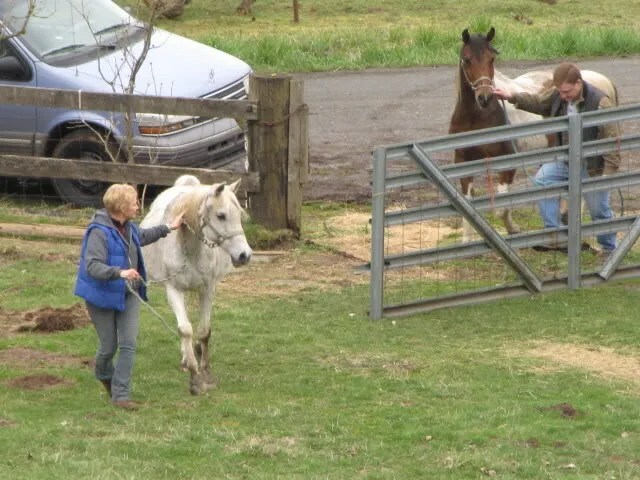 But we put out the word that we’d like to have another horse here, and through word of mouth at church, we were introduced to Joan, who was looking for a place to pasture her horses. Because of their age, she didn’t ride them anymore and didn’t need a regular boarding/riding facility. For the past two months, Joan and her woodworker son Scott have been building two stalls in the barn. She is a meticulous owner and wanted everything to be just right for her babies. 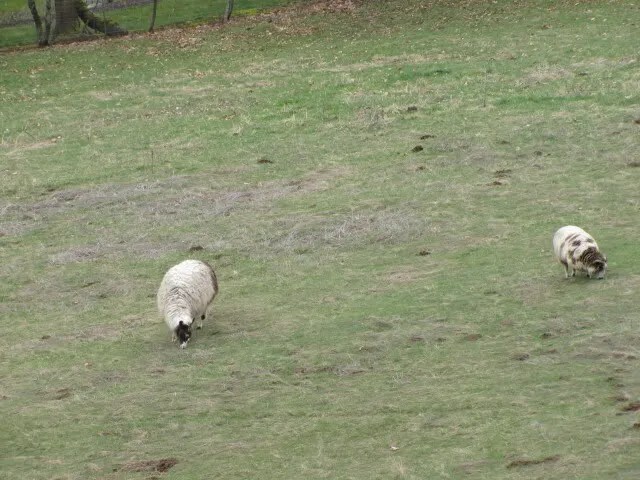 She, Scott and Nolemana walked the pasture looking for any problem areas. They chainsawed down any dead or poking-out dead fir branches and made sure the fences were sound. Joan’s horses, Poem and Ricky, are very special. She wanted to have a safe place where they could retire to live out the rest of their lives in comfort. They’re both Arabs and both twenty-six years old and deserve a contented, happy life, just relaxing and enjoying an end to their labors. When Joan first called me and told me about them, the wai maka began right away that we could be part of her horses’ retirement. It was a perfect solution for all of us. Poem is a silvery gray mare with papers a mile long. At one time she was used for dressage, but then ended up neglected and slowly being starved to death by her former owners. Joan rescued her. Ricky is a gorgeous pinto gelding. Today was the big day. The stalls were built, the pasture ready, and plenty of hay in the barn. I stood out on the deck ready to take photos. Shortly after noon, Scott drove the trailer up our road with Joan following in her car. 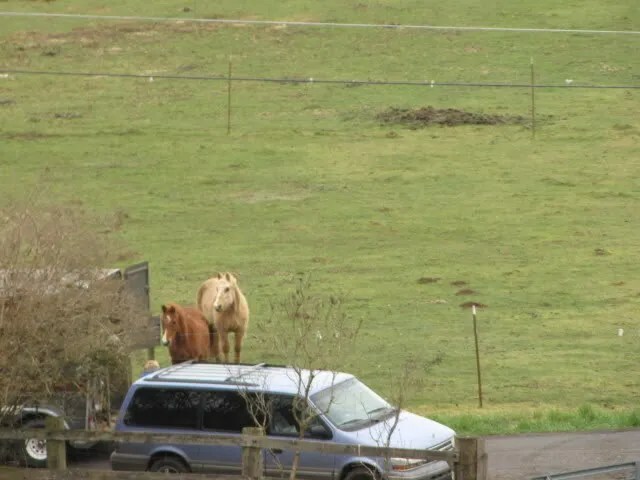 They both parked at the bottom of our pasture. Sam and Sierra seemed pretty unconcerned at this point and just kept on grazing. Nolemana waited in the corral with Pikake and Puakea; we didn’t want them running out and spooking the horses. 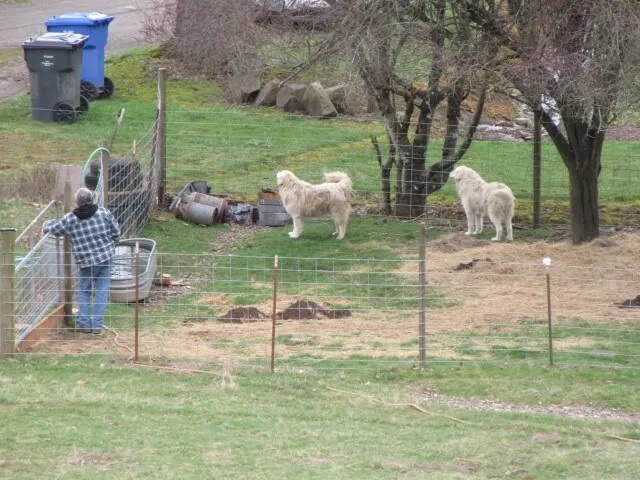 As Livestock Guardian Dogs (Maremmas) it’s their job to get acquainted with any new livestock coming into the pasture so that they know who to guard. Rayado the llama and Paul didn’t pay much attention either. Suddenly Sierra and Sam realized that something was going on. 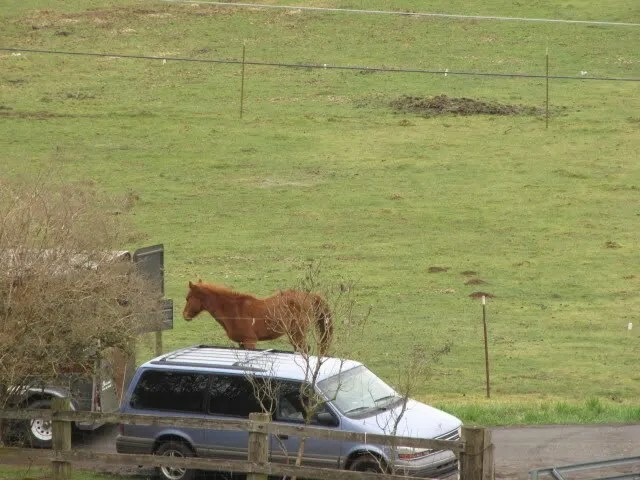 Joan was getting out of her car in a new place; they waited to see what was happening. Joan and Scott were at the trailer, and Sam was getting pretty antsy. Rayado and Paul munch grass, unconcerned still yet. 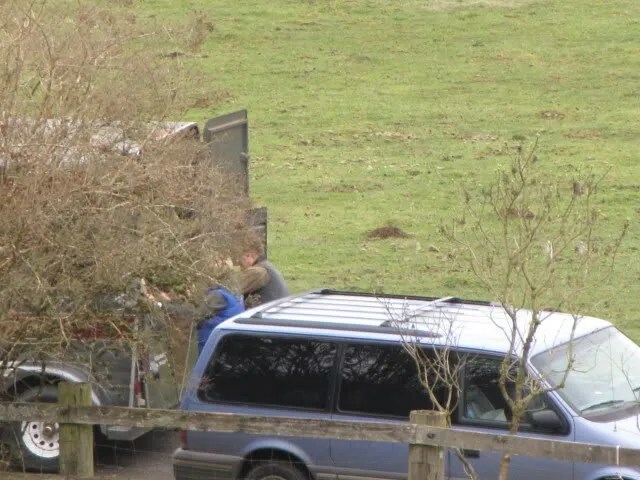 Joan and Scott open the trailer to unload the horses. That got Sam and Sierra’s attention! They began to get hyper, walking quickly back and forth to see if they could see better. Here comes Ricky! Sam is going nuts! 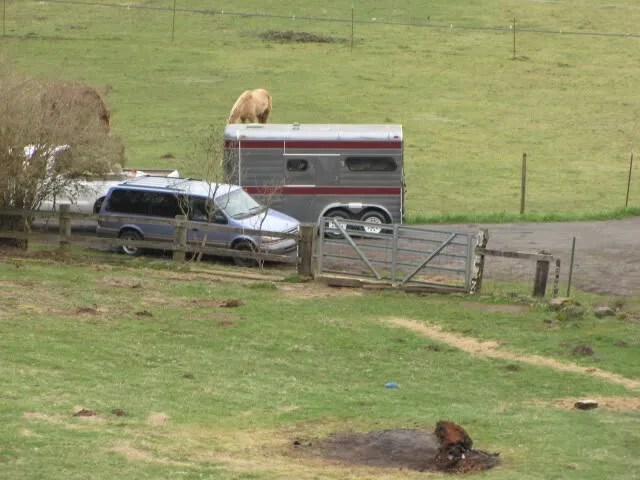 Poem is already in the pasture. 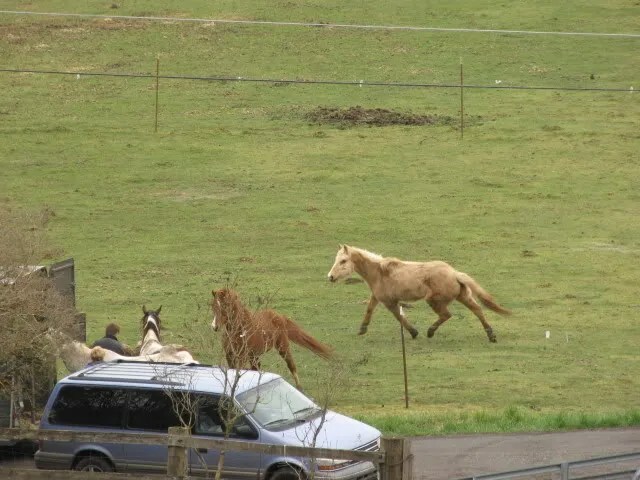 Joan and Scott take off the horses’ halters, not knowing if they’d bolt in the open pasture. 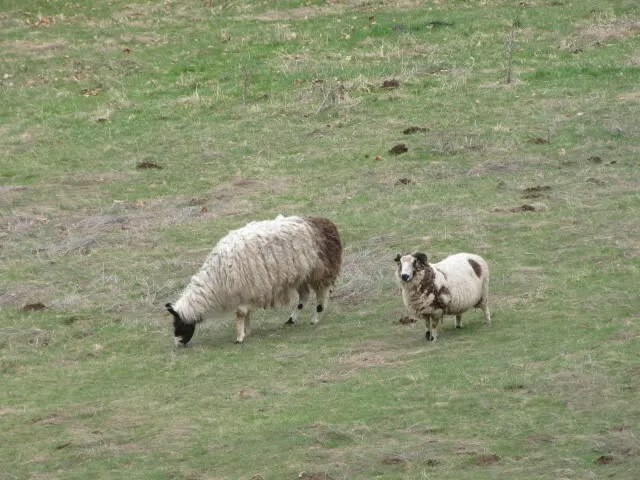 Instead, Poem immediately begins grazing. She must be local Hawaiian! 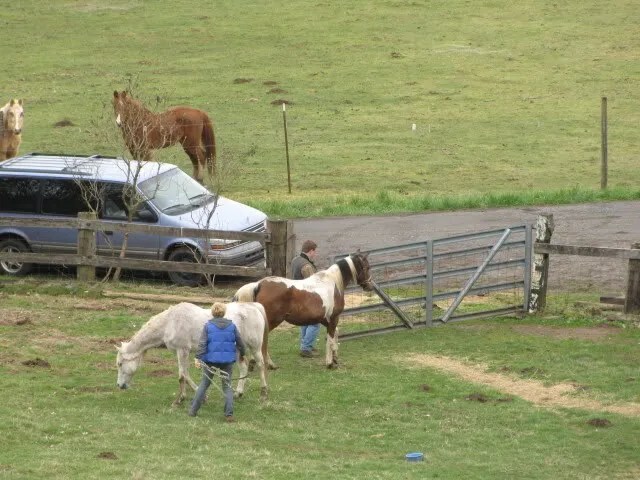 Ricky kinda looks around, while Sam and Sierra watch, whinnying to the newcomers. Stay tuned for what happens next! This entry was posted in Da Kine: Sometimes Full-on Pidgin, Farm Stuffs. Bookmark the permalink. Oh wow, they are gorgeous! Your dogs are amazing! Huge!! What a great story. Looking forward to the next installment! Great photos!!! I love your dogs too….love those names! Oh, I love those photos and the story! How lovely! I rode Arabs all da years wen I did ride. Still got my handmade Arabian saddle, completely authentic in every detail… Arab students help me with all the details back in ’64, made out of black and red yarn on a isfahan rug base. I sen you pix private wen I pull em out… the whole thing was made for a silver gray Arab! 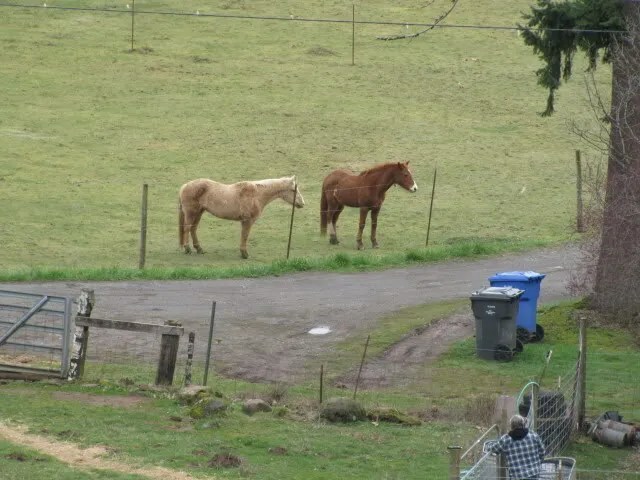 You got two wonderful horses there… wish they were closer… would come visit! Lookin forward to next installment!